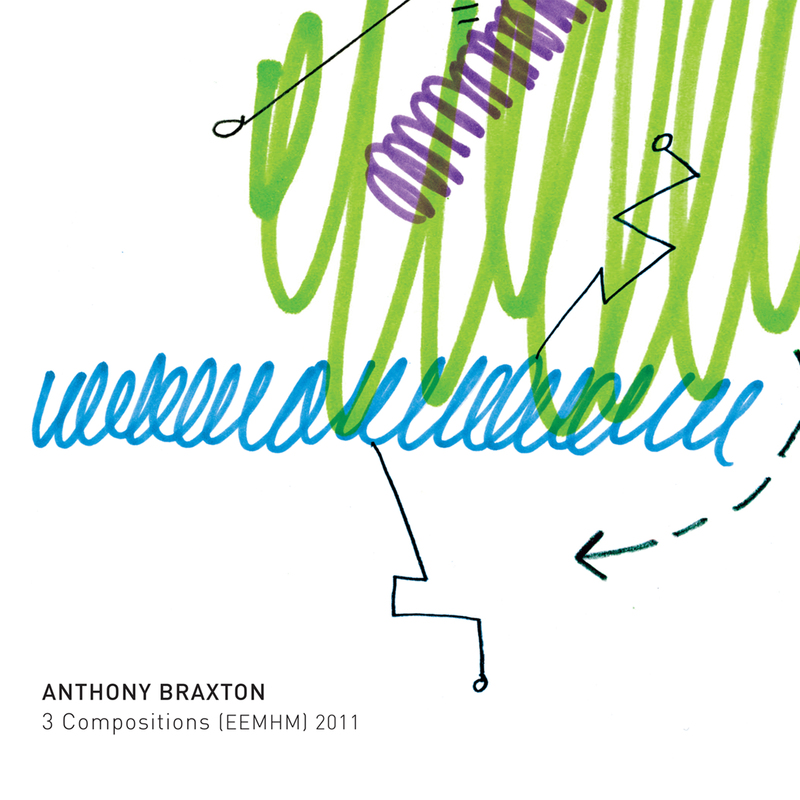 Anthony Braxton‘s Echo Echo Mirror House Music (EEMHM) system is unlike his other compositional constructs. Notably, it features several musicians (in practice, 7-14) armed with their instruments and iPods. The iPods contain recordings from Braxton’s extensive back catalog. At given points in a piece, the musicians can choose whether to play or to provide one of these historical recordings instead. The result is an information-dense listening experience, often with at least 3-4 distinct melodies occurring simultaneously. This organized chaos is beyond jazz, classical, or any other pigeonhole or category. It is a unique Braxton creation. This boxed set, which is available as three CDs or a download, offers Composition Nos. 372, 373, and 377, each about one hour in length. It is a lot to swallow. The recordings occurred in May of 2011 at New Haven’s Firehouse 12. The only other recordings in the EEMHM system also took place in 2011, in New York and Victoriaville, respectively. It is not clear whether Braxton plans to continue developing this system and providing further recordings, or these three (or five) pieces will be it. Ultimately, it may not matter, because there is so much to unravel here that listeners and musicologists may need years to fully appreciate the EEMHM scope. With Braxton on this particular offering are frequent collaborators (all of whom I believe are former students) Taylor Ho Bynum, Mary Halvorson, Jessica Pavone, Jay Rozen, Aaron Siegel, and Carl Testa. This is the same lineup from the Victoriaville recording. But the individuals performing in an EEMHM recording seem less important than you might think, as incorporation of the recordings diminish each player’s distinct contribution. Instead, their choice of recording can be their most relevant contribution. As a result, Mary Halvorson’s signature guitar style is mostly hidden, and when you hear a Braxton sax line, it is unclear whether it is “live” or a past recording. Perhaps one of the points Mr. Braxton is trying to make is that it does not matter. Like his other music systems, EEMHM involves conducted improvisation and non-traditional notation. On these pieces, the latter consist of actual maps of airports, subway systems, highways, and so on. The players are encouraged to improvise “travel” through these virtual landscapes. The outcome is something reminiscent of a journey through a sound installation, where you can simultaneously hear different pieces of music played at varying intensities from different speakers. It is no secret that I am a fan of the EEMHM system and, as you might gather from my previous reviews of the New York and Victoriaville releases, something about these recordings speaks to me. I’m not always sure what it is saying, and I might never figure that out, but I like what I hear. If you are unsure whether this is your cup of coffee, check out the sampler below for a singular experience.